Grilled portobello mushrooms make the best vegetarian burgers. Learn our technique and get our tasty recipe here. Our Vegetarian Burger Topic is brought to you by Produce for Kids, your healthy family resource for nutritious meals. I had a friend in my high school culinary arts class that was a vegetarian. For our final project we were partnered together to create a luncheon to serve to the teachers in the school. After debating what we should serve, we both agreed to go vegetarian. And that is when I tasted my first portobello mushroom burger. Everyone loved it, and thus started my obsession with portobello burgers. And when I say obsession, I mean, I order it every time it’s on a menu and make it at home as often as possible. One of the great things about portobello mushrooms is their umami (meaty) taste, which makes mushroom burgers something that even meat-eaters can get behind. (Note that mushrooms have a lot of meaty flavor but are definitely not meat. They are not a vegetable either. Mushrooms are a fungus. A tasty tasty fungus. Mmmmm). 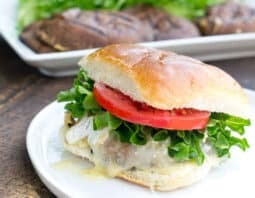 Unlike most vegetarian burger recipes this one does not require any chopping of vegetables or forming of patties which makes this recipe fast! Add the marinade, grill, eat. Yum yum yum. 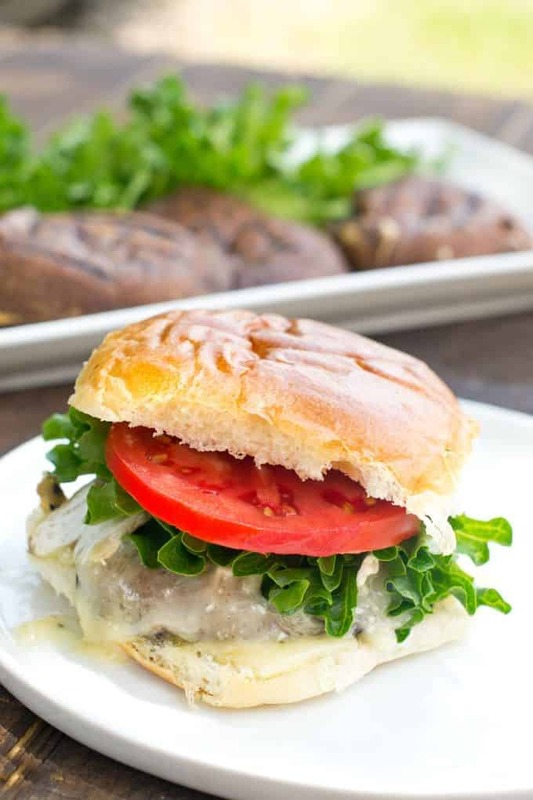 Note that the idea behind this recipe (the portobello mushroom, the brie cheese and the pesto mayo) are inspired by a mushroom burger that was served at the Falcon Lake Deli in Manitoba, Canada, the restaurant that was owned by our editor Christine’s parents for years and years. Trim stem off of portobello mushrooms and wipe dirt off of the mushrooms with a wet paper towel. In bowl, mix together olive oil, lemon juice, garlic, salt and pepper. Place mushrooms on plate gill-side-down and brush lightly with olive oil mixture. Flip the mushroom and brush the gill side with remaining mixture. Let sit ten minutes. Preheat grill to medium heat. Add mushrooms gill side up and grill until nice grill marks are underneath, about four minutes. Turn the mushrooms 90° to create grill marks and cook two minutes longer. Flip and repeat. Flip mushrooms again and place 1 oz of brie on the mushroom and allow to melt. Take off grill and place on plate. In small bowl combine mayonnaise and pesto. Spread 1 tablespoon of mixture on each bun. Add mushroom to bun. Top with your favorite burger toppings. This post originally appeared in July, 2016 and was revised and republished August, 2017.